It’s long been known that SUVs are hardly the safest vehicles on the road, both for their occupants and the occupants of other cars (as well as pedestrians and cyclists). A recent study published in Injury Prevention, “Non-fatal and fatal crash injury risk for children in minivans compared with children in sport utility vehicles” M.J. Kallan, K. B. Arbogast, M.R. Elliott, and D.R. Durbin, looks specifically at the safety of child occupants of those vehicles, and finds minivans come out on top. When it came to crashes that caused injuries but not deaths, Dr. Dennis Durbin of the Center for Injury Research and Prevention said children in minivans were 35 percent less likely to be hurt than children in S.U.V.’s. Looking at fatal crashes, there was a 24 percent greater chance of a child being killed in an S.U.V. than a minivan, the researchers found. Dr. Durbin said the reason for that was clear: S.U.V.’s had more rollover crashes. The study found that 66 percent of the S.U.V. fatalities involved a rollover, compared with 37 percent for minivans. Rollovers, to be sure, account for a great deal of the difference. I might also argue that SUVs are driven differently due to the higher seat position of the driver (they feel as if they are moving more slowly than a driver in a lower vehicle). But while the study wasn’t able look at driver behavior factors, this should not be overlooked. Different sorts of people are drawn to different vehicles, and they drive them differently. One of my favorite examples of this comes from Leonard Evans’ book Traffic Safety and the Driver. As the chart reproduced below shows (the car models are somewhat antiquated at this point), the crash involvement rate for vehicles was higher in the sedan version of the car than in the station wagon version, and it is generally higher in the two-door models than the four-door models. It is not, as Evans argues, that safety is a matter of simply adding a few more doors, or getting rid of the trunk. It is that “vehicle factors” sometimes matter less than human factors. Compounding the problem of course is that there has been a move away from minivans, never depicted as anything but safe and staid, into SUVs, whose marketing messages and vehicle characteristics are more often oriented toward aggressive driving (in fact there is anecdotal chatter about people moving into SUVs because they didn’t want to be branded with the “soccer mom” pejorative, as if SUVs themselves didn’t now have that legacy). Comments Off on Why SUVs Are Less Safe Than Minivans. Click here to leave a comment. I would side with Ian Walker (who of course is featured in Traffic) in his assertion of cross-cultural differences. 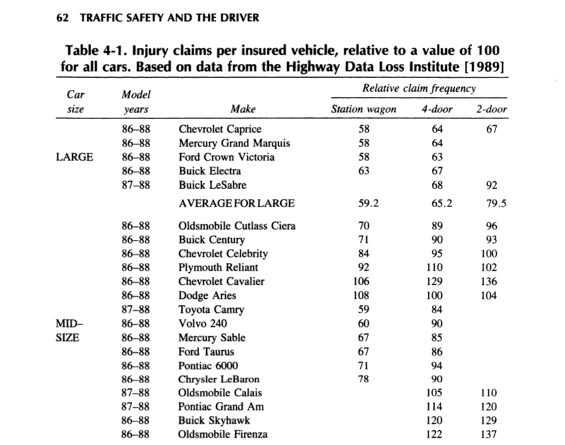 Nothing in the traffic world (fatalities, laws, norms, etc.) translates easily across borders — not even state borders. The U.K. driving population, the landscape, the safety rate, the regulations, etc., have little to do with U.S. traffic culture. And while I find the Gutierrez work interesting, I can’t also help thinking it comes shrouded in a militantly ‘vehicular cycling’ agenda — I really can’t imagine many civilians out there would even feel comfortable in the first instance riding on that road on which they’re riding (in L.A., where cyclist-car relations have been less than rosy), much less taking up big amounts of road space. Which points to a larger sort of question: Is this what we should be worried about to begin with? Is a cycling culture going to be built on a game of inches from cars overtaking at high speeds? I can’t imagine these are top-of-mind concerns in the Netherlands or Denmark (but I could be wrong). But like I said, I’m still digesting, only wading into a very deep pool here (Google ‘vehicular cycling’) and primarily wanted to highlight the exchange. Comments Off on Walker Vs. Gutierrez. Click here to leave a comment. I picked up the immensely pleasurable Schott’s Miscellany 2009 last night and was delighted to find a number of traffic-related nuggets. Which state has the most drivers per 1000 pop.? Connecticut, with 800. The fewest: New York, 577. The state with the most miles of road is, not surprisingly, Texas; but I was surprised by the third entry: Kansas. Where does everyone go in Kansas? I also learned that in 1996, 40.6% of 16 year-olds held a driver’s license; by 2006 that figure was 29.8% (not a bad thing, in my mind, as GDL is arguably the only teen driver intervention to show significant results; as someone recently joked to me at a traffic conference, ‘we should lower the drinking age to 16 and raise the driving age to 21’). Comments Off on Schott’s Traffic Miscellany. Click here to leave a comment. A SIGN on an overhead gantry on the M1 motorway near Leeds in the north of England reads “THINK DON’T PHONE”. Rowan Brown is willing to do his best to obey this exhortation to use telepathy, but he is concerned that the effort involved would be even more distracting to his driving than using his phone would. He wants to be sure that the transport authorities who erected the sign are sure that “driving while engaged in telepathy” is safe and not an offence. Comments Off on Think Don’t Phone. Click here to leave a comment.